In the city of Eldra, people are ruled by ancient prophecies. For centuries, the high council has stayed in power by virtue of the prophecies of the elder seers. After the last infallible prophecy came to pass, growing unrest led to murders and an eventual rebellion that raged for more than a decade. In the present day, Cassa, the orphaned daughter of rebels, is determined to fight back against the high council, which governs Eldra from behind the walls of the citadel. Her only allies are no-nonsense Alys, easygoing Evander, and perpetually underestimated Newt. Cassa struggles to come to terms with the legacy of rebellion her dead parents have left her, and the fear that she may be inadequate to shoulder the burden. But by the time Cassa and her friends uncover the mystery of the final infallible prophecy, it may be too late to save the city—or themselves. 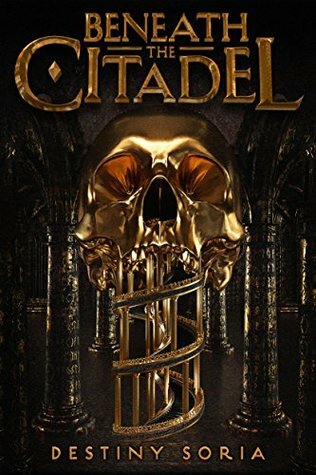 Beneath the Citadel by Destiny Soria is a young adult fantasy read. This one has been compared a bit to Six of Crows and I can see that comparison in the somewhat rag tag group of teens coming together and going against their society. The story takes place in the city of Eldra where a group of teens have come together as a last effort in a rebellion against the council. Told from their different points of view the book starts as each have been captured after an attempt to sneak into the citadel and are about to be sentenced to their deaths. Obviously the story is not going to end in the opening chapters so there’s a plan of escape on the horizon for readers as the story gets going rather quickly. With this there is also the beginnings of the different types of magic brought in with each of the group having different abilities and personalities. Now, for me I debated quite a while on my rating for this one as it jumps right in and took off at a fast pace which I loved. However then the world and character building seemed to start being dumped in after the bang of an opening and it slowed the story down somewhat. Once going again I did like the story until the end which I won’t go into but it just seemed a bit off the way some things were dealt with. So overall I’m going with 3 stars but it’s falling around 3-3.5 to me. Destiny Soria is the author IRON CAST, a YA historical fantasy, and BENEATH THE CITADEL, a YA high fantasy slated to be released Fall 2018 by Abrams/Amulet. This book is my loving tribute to all the teenagers who are valiantly fighting to fix a world that they didn’t break. The future is yours.